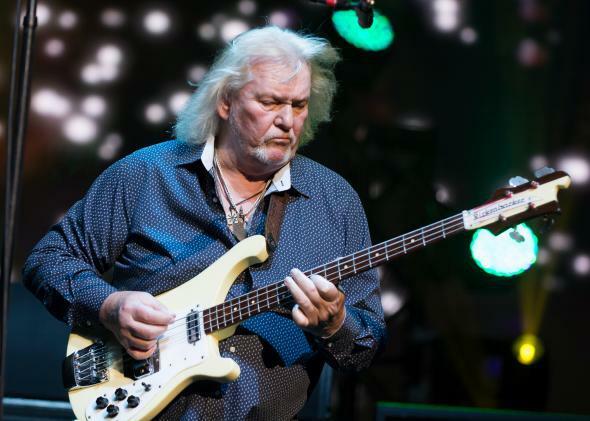 Chris Squire, dead at 67: The Yes bassist was the very loud, beating heart of the prog rock band. Chris Squire and his Rickenbacker. Thanks to Squire, Yes outlasted almost every one of its progressive rock contemporaries. Squire co-founded the band in 1968, when he was 20 years old. Last month, when he announced that cancer would keep him offstage, he called it “the first time since the band formed in 1968 that they’ll perform live without me.” That rattled fans. Up to then, to go see Yes—a band that usually contained at least three virtuosos at any given time—meant to go watch Chris Squire plus whoever he played with. Squire was unpretentious about his discovery of the bass. According to author Chris Welch in his biography Yes: Close to the Edge, Squire got into rock ’n’ roll belatedly, and only picked an instrument after a guitarist friend told him, “You’re tall and you’ve got quite big hands.” (Squire stood 6-foot-4.) Squire played the Rickenbacker bass as a lead instrument, bursting with melodies. He was describing the classic iteration of Yes. From 1970 to 1979, Yes grew into one of rock’s most ambitious bands. Drummer Bill Bruford left; keyboard player Rick Wakeman joined, then left, then unfurled his cape and joined again. This was the band that broke big with “Roundabout,” a song that begins with pastoral, processed guitar and gets its drive from Squire’s racing bass lines. And along with Howe, Squire would join Anderson in rich, soft harmonies and vocal melodies. This was the band that could sweetly sing the mantra of “I’ve Seen All Good People”—“’cause it’s time, it’s time in time with your time”—over an organ, let it fade, and then let Squire lead the pivot into a rock song. This was also the band that recorded multiple side-long suites of music, culminating with Tales From Topographic Oceans, four songs that filled two records and were played in their entirety, to quietly frustrated audiences. The “classic” line-up of Yes petered out after Tormato, an album that includes both a genuine Squire love song (“Onward”) and songs where his bass tone seems to have dropped out of George Clinton’s mothership (“Don’t Kill the Whale”). When Jon Anderson and Rick Wakeman left the band, Squire replaced them with the Buggles. Trevor Horn and Geoff Downes, who were about to have a hit with “Video Killed the Radio Star,” were plunked into a 12-year old progressive rock band. Onstage, Squire looked perfectly happy. But that was not the highlight of his cruise. Each night, the more musically-inclined passengers took over a lounge to play through hours-long setlists of progressive rock classics. On the second to last night they played “Gates of Delirium,” Yes’ longest and most melodically complex song, inspired by War and Peace and grounded by Squire’s bass lines. Squire and his family walked in on the performance, unannounced. He sat on a wraparound leather couch, daubing away tears as five fans played every note of a 22-minute Yes song. The bass was mixed very loud.